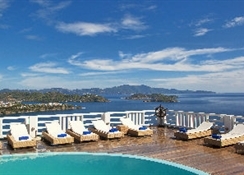 The recently refurbished (2010) superb 4 Star Kivo Hotel & Suites rests right on the hillside overlooking the gulf of Vassilias, offering guests a panoramic view of the sea and the town of Skiathos that will literally take your breath away whether it be daytime or night. This is truly a unique property ideally suited to couples and those look for the perfect romantic getaway. Only 900 m from the beach on the island paradise of Skiathos, the amazing views of the Aegean Sea greet visitors where they experience perfect harmony between luxury and simplicity, warm hospitality, a sophisticated atmosphere and 40 sumptuous double and triple guestrooms combining simple elegance with modern amenities. Guests to the Kivo Hotel & Suites can discover marvellous beaches and fishing villages, walk to lots of shops, bars, and restaurants, and enjoy a nice range of water sports on the beach. 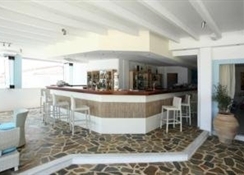 Skiathos Airport is 4 km from the Kivo Hotel & Suites. Local Tips: There is a regular bus service in front of the hotel providing easy access to Troulos, Koukounaries and Skiathos Town. Food and activities: Bed and Breakfast accommodation with an option for Half Board. 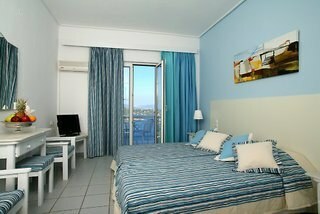 The Kivo Hotel & Suites has several dining areas, all with lovely views of the sapphire sea or the lush gardens. There is a delicious breakfast buffet, a main restaurant with international and Mediterranean cuisine and live Piano music, a living room, pool bar, beach bar, and breakfast can also be served in the room. Why not accompany the dinner with a bottle of one of their award winning wines, from the hotel's own wine cellar? 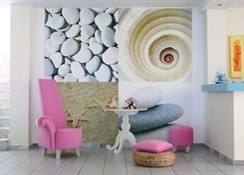 Entertainment can include lively pool parties and live music nights inspired from Greek and International music. New for 2012 is the 'Mystique Lounge Pool' (only on request and arranged locally). 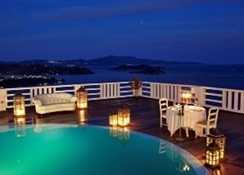 This is an exclusively private area within the hotel where guests are able to celebrate that certain special occasion with a dinner for two, overlooking an infinity pool and the beautiful bay of Skiathos. Sports, games and activities: Outdoor swimming pool with breath taking views of the sea, sun terrace with sun beds and umbrellas, 1 children's pool, garden, SPA and wellness centre with Jacuzzi, massage and sauna (some services with charge), Playstation 3, water sports on the beach (some activities with charge). Additional: 24 hour reception, free pick up services, mini bus transfers (all day), car rental, motorbike rental, luggage storage, dry cleaning, safe deposit box, fax/photocopy service, Internet point Wi-Fi, ironing service, laundry, 24 hour room service, doctor on call, babysitting on request with charge, wedding planning, credit cards accepted, free parking. The Kivo Hotel & Suites features 40 double and triple guestrooms with modern amenities. All rooms are available with King Size or twin Beds, comfortable sitting area, and glass bathrooms with bathtubs, hair dryer, and bath amenities. All rooms include air conditioning, plasma Satellite TV, CD player, DVD player, telephone, safe deposit box, mini bar, wake-up call service, Wi-Fi Internet access, and a balcony or patio with breathtaking sea views. Free baby cot available on request.